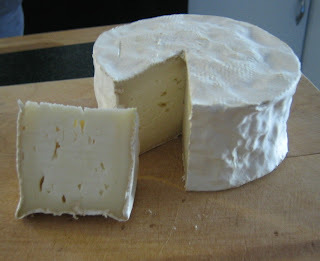 Last night I started the first of a four week class, A Full Introduction to Artisan Cheese and Its Histories at the College of Marin. It covers topics like classifications of cheese (hard, soft, washed rind, bloomy rind, blue), how to professionally assess a cheese (sight, smell, touch, taste, after taste), cheese history and more. This class attracts a variety of folks, from chefs, to farmers, to cheesemakers and lots of cheese eaters. It is a bit torturous to sit through, as everyone has a tray with eight different cheeses sitting in front of them that are not supposed to be eaten until two hours into the class! I will get the chance to also take the hygiene class during my internship at Toluma Farms and hope to eventually complete the whole program. Hey Callie, did you make the cheese in the picture? I do wonder about who was the first person to think, "what would happen if I put this stuff into milk, watch it curd up, and eat it." I know cheese making has been around for thousands of years but someone had to be the first one to try it. Right? You are being educated in a lot of different things, aren't you. Good luck with your class and your cheese making. Have a great cheesy day. Callie, what a fun and informative class! Sounds very interesting! Do you make any of your own cheese now? I've only dabbled in simple cheeses so far. My hubby made me a really nice cheese press, and I want to try some aged cheeses in the future. I love cheese, way more than I should!